Who between these two will be put 1st to sleep? We all remember how Maskev already once knocked Hasim through the ropes to headhit computers. If Maskaev wins than no blacks in all versions? Rahman gets his revenge. I just hope isn't a hug feast, that's what Hasim has been doing allot lately. I'm sure that right that sent him through the ropes will be in the back of his mind and bring a more cautious Rahman. That will onlylead to hugging and turn a slugfest into a boarfest. Hope I'm wrong, I'm buying the fight and never miss a heavyweight tittle fight when ever possible. If Rahman doesn't KO Oleg early than he's going defence and that will put anyone to sleep except the fighters. I noticed the USA guys keep on mouth closed when their patriotic feelings are shaking. So I read in internet Maskaev put to sleep the Rahman guy in the end of the match. So I right 4 russian speaking guys ( of an USSR origin or wtf u spell it? ) hold the heavy weights in 4 main boxing feds? what country is Maskaev a citizen of? he gave an interview to russian tv and said he encounters problems receiving russians citisenship. He's speaking russian perfect and born in some USSR respublic (SP? ).... Give just the road its called. no offence. ohh yes he said he's the citisen of USA. the problem is that "cough that Rasim have announced if he loses it will be the shame for him family and primarily for USA" cough"
what do you have against blacks? do you live in the US? is there a black culture in Russia or wherever you're from? I dont live in USA. Blacks are fine the problem is what if next white takes the 100 metres reckord. It will be the heart attack for all black community? Can we dream? lol relax. i was just wondering why someone who doesn't directly encounter african-americans would have something against them . . ."mofo gum"
it would not bother me at all if a white has the 100 m record . . . although I don't see that happening. Well may be when chewing mofo gum Rasim didn't mind that Maskaev, if what the USA citizen, and whats the point once he ( Hasim ) loses it will be the shame for the USA. Well Im straight from the bar if you no what i mean. let me dream white soon sets the rekord time in 100 metres. 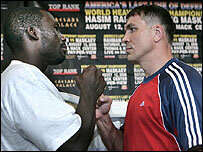 I'll cheer for a Ruskie over someone named Hasim Rahman, anyday. maskaev--now an american--was born in Kazakhstan . . . primary religion in Kazakhstan is Sunni Islam. I don't know what "straight from the bar" means. Rahman made a big to-do that he was fighting for the US etc., but everyone knows that just a bunch of weak trying to get attention crap. In a lot of ex-soviet countries you have pretty big russian minorities. Many of whom feel 100% russian and only speak the russian language. I doubt he has any Kazak blood in him or that he is muslim. Anyone watching the fight. Boxing is corrupt and has become a boring sport to watch. Mixed Martial Arts is the future.